Robotic telepresence technologies go beyond videoconferencing. Like Skype or Facetime, your face is on the display and you can converse in real-time. However, you “teleport” into the robot using an app on a computer or mobile device and move the robot independently as if you were there. You can move across the room and down the hallway. You can see and hear what’s in the room, and they can see and hear you. You are virtually there. These devices are used at work, in museums, at schools, in hospitals and at home. 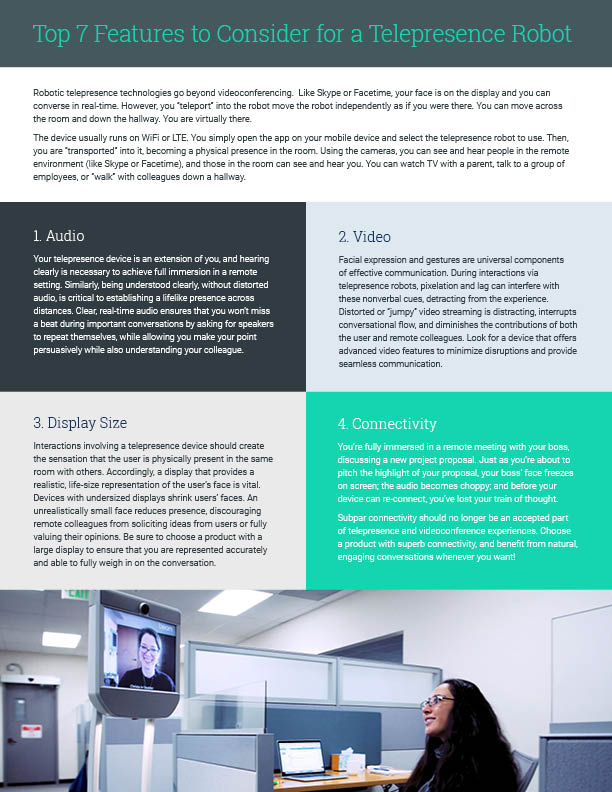 But how to you find the right telepresence device based on your needs? Download this paper to get the Top 7 Features to Consider.